Photographed in Hope Town, Elbow Cay in the Bahamas. This shawl uses a garter tab and traditional triangular shaping. Increases are worked at the center spine and at each edge every right-side row. Stripes are created by alternating sections of plain stockinette with triple-wrapped stitches, but unusually, these are horizontal stripes across the shawl, instead of following the diagonal line of the increases. 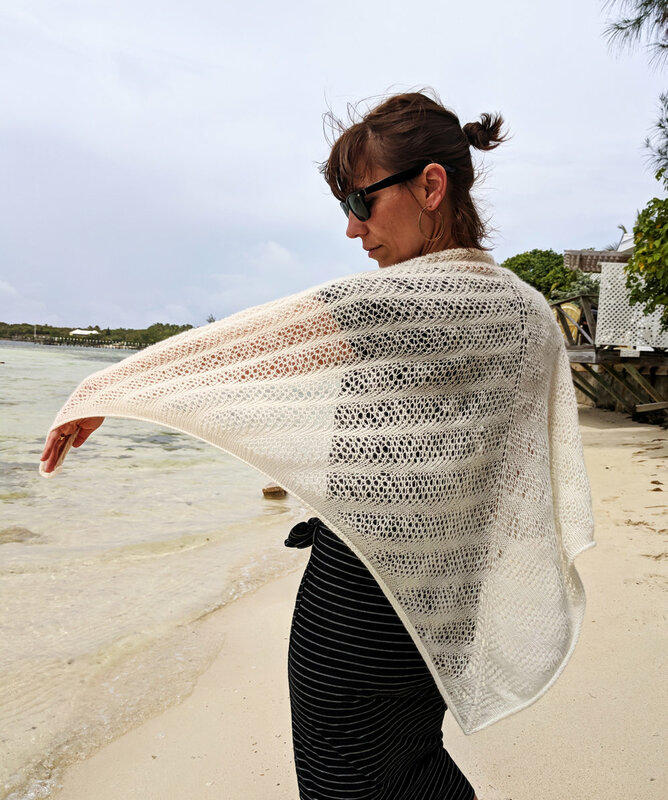 This unfussy, modern take on a lace shawl is finished with a casual, curling edge of plain stockinette, inspired by the easy-going attitude of the tropical island where it was designed. Choose a circular needle with a very smooth join, as the triple-wrapped stitches can catch where the cable meets the needle. Due to the triple wrapped sections, gauge can be quite variable from knitter to knitter, so measure on a stockinette swatch. Designed by a loose knitter - use the needles that produce a fabric you like. 31”/79 cm long, 62”/157 cm wide at top. Giveaway: Win the Yarn to Make Stegner! Win the Cascade 220 yarn to make your own Stegner sweater! Join my mailing list by April 26th, 2019 to be entered.